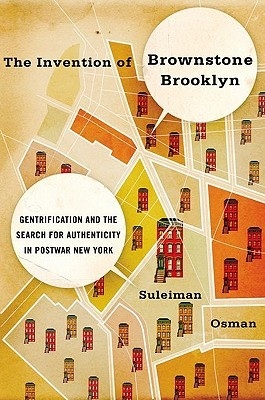 Suleiman Osman, The Invention of Brownstone Brooklyn: Gentrification and the Search for Authenticity in Postwar New York; 2011, book. This project examines the history of gentrification in Brooklyn from 1945–80. The project locates the origins of gentrification in Brooklyn in the cultural upheavals of the 1960s and '70s. Gentrification began as a grassroots movement led by young and idealistic white college graduates searching for "authenticity" and life outside the burgeoning suburbs. Where postwar city leaders championed slum clearance and modern architecture, "brownstoners" (as they called themselves) fought for a new romantic urban ideal that celebrated historic buildings, industrial lofts, and traditional ethnic neighborhoods as a refuge from an increasingly technocratic society. The project examines the emergence of a "slow-growth" progressive coalition as brownstoners joined with poorer residents to battle city planners and local machine politicians. But as brownstoners migrated into poorer areas, race and class tensions emerged, and by the 1980s, as newspapers parodied yuppies and anti-gentrification activists marched through increasingly expensive neighborhoods, brownstoners debated whether their search for authenticity had been a success or failure. Suleiman Osman is currently assistant professor of American studies at George Washington University. After receiving his degree in American civilization from Harvard in 2006, he was hired by GWU as an urban historian. His first book The Invention of Brownstone Brooklyn was published by Oxford University Press in March 2011.